For the third consecutive year, in 2015 Cyberclick will continue to be the partner in charge and referent of LAN and TAM for capturing leads through microsites in its different European markets. LAN and TAM airlines as a single entity have more than 40 thousand employees, approximately 280 airplanes and 115 destinations in 23 countries. Their multiple flight paths cover South America, North America, the Caribbean, Europe, Oceania and Polynesia, although their stronger structure and brand positioning is robustly focused in South America, making the airline an “expert” in all its destinations. 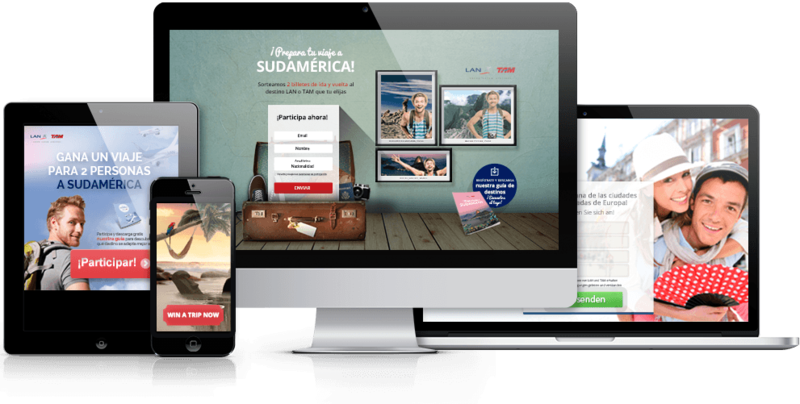 The last campaign from September to December 2014 was a success in regards to the rates obtained on the different channels of the strategy, as well as in meeting the company goals. The milestones on established lead volume were 40,000 leads in Spain, 18,300 leads in Germany and 6,000 leads in UK, all within an approximate 3-month period. These leads contributed to the continuous growth of the respective databases, whose members receive company information, offers and promotions. Through subsequent communications to these users, LAN and TAM analyze their behavior and profile to work the lead nurturing funnel until the final conversion. On the creative level, we did a restyle of the graphic materials used in 2013. This twist in the design added a greater branding component to balance the strong push of the aspirational prize proposed (trip to South America to the destination of the winner’s choice) with precise awareness of the participants of the airline and its positioning. In addition to the main incentive, the added value of offering the user a free downloadable Guide only accessible after completing the form was incorporated. 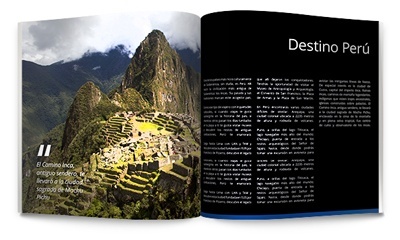 This guide allowed participants to find out which was their “ideal” South American destination through high level descriptions of the attractions of some of the key destinations (Peru, Brazil, Chile, Ecuador, Argentina and Colombia). All campaign materials (banners, emailing piece, landing pages and Guide) were adapted to English and German to take the subscriber acquisition to UK and Germany. 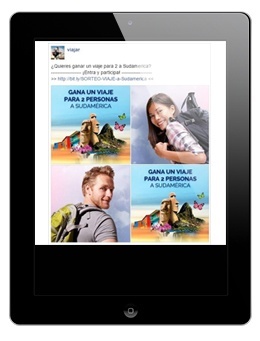 Page posts in Facebook in communities related to the company, like "Travel"
On all of them and especially during the first weeks, several rounds of A/B testing of different variables were conducted (subjects, images, texts, messages, characters) until finding the formulas generating more conversion in each country. Are you curious about the result? Any bets? Except for smaller actions, the guy obtained a higher CTR of 13.64% compared to 12.95% obtained by the girl. As you can deduce, the difference was not significant and prevented the databases from choosing one or other variant according to the segments selected on their mailings. An interesting fact was that in some vast volume actions the traffic from the emailing with the girl had a greater conversion in the landing page, with a relevance of up to 10 points above the guy’s version (25.24% vs. 16% LTR). As we mentioned above, the dissemination of the 3 campaigns was done through display, emailing and social media. The weight of each channel was different for each market; Spain played a strong role and fairly equal in social media and emailing, and in UK and Germany it was emailing followed by display. 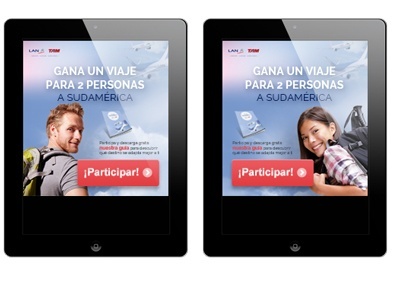 In Spain, the page posts published in Facebook’s leisure and travel communities had a very high response during the whole campaign, and the formula of the main characters and the illustration of LAN AIRLINES representing the most emblematic symbols of each destination also used in a more global advertising campaigned worked particularly well. Its bright colors along with a very short, direct message allowed us to attract more than 1.856,000 users and 32,773 clicks to the landing page (1.76% CTR). The behavior of this traffic at the microsite obtained 16,600 registers; thus, the conversion rate was 50.65%. This unprecedented percentage is without a doubt the highest registered in the campaign, well above any other channel and country. On emailing, Spain registered an average opening of 11% and an average CTR of 13%, with some irregularity on this last rate between the different databases participating in the dissemination. The conversion of clicks to leads stabilized by the second week of the campaign to 18- 20%. This performance channel allowed to add more than 20,000 leads to the campaign. In the British market, the objective of getting leads was lower (6,000 leads), and the emailing channel contributed to it with approximately 83% of the registers. 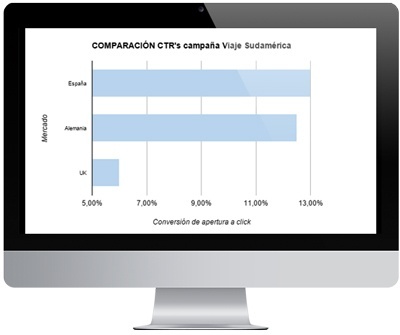 The resulting CTR was markedly lower than the 6% in Spain; however, the users who clicked on the html piece were much more active and qualitative, with 44% of them leaving their data on the landing page form. In Germany, the CTR on emailing registered was more similar to the Spanish market, with 12.5%. 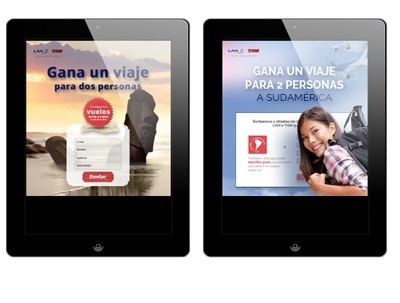 The behavior here, however, is radically different in the conversion of the landing page and very far from the Spanish – and particularly the British – market, since only 6% of the users who clicked decided to leave their data in the microsite (practically 3 times less than in Spain). However, 95% of the leads were contributed by email Mk actions only complemented by a small display player which – to everyone’s astonishment – converted 35% in the landing page. Finally, we added the results in the experiment of including the destination Guide as free content of added value and driver of the conversion. After leaving their data, participants in Spain showed a much higher response level than Germany and UK, who shared similar behaviors. 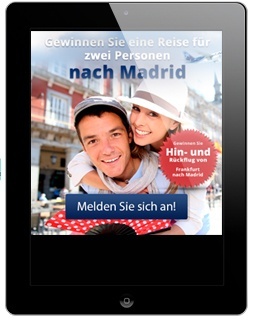 19.5% of Spanish users downloaded the Guide, compared to 3.58% and 3.77% in Germany and UK. In the German market, in addition to these global campaigns conducted on 2013 and at the end of 2014, we included an ad hoc action in spring 2014 with the incentive of a trip to Madrid departing from Frankfurt. It is interesting to see how this other campaign contributed particular insights of this market and was much welcomed by the distributor-partners for this reason. 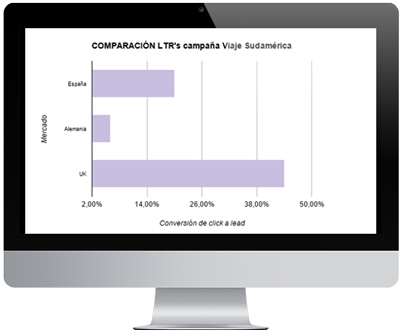 The affinity of German citizens with anything related to the Spanish culture, as well as the perception of a more doable or feasible trip (compared to South America) drove the reach of the conversion rates in the landing page to more than 25% - 4 times higher than the campaign for the South American destination, even though the prize had a higher perceived value, more aspirational a priori. This shows the creativity of emailing. Its look and feel meets several Spanish stereotypes seemingly very well-valued according to the response.